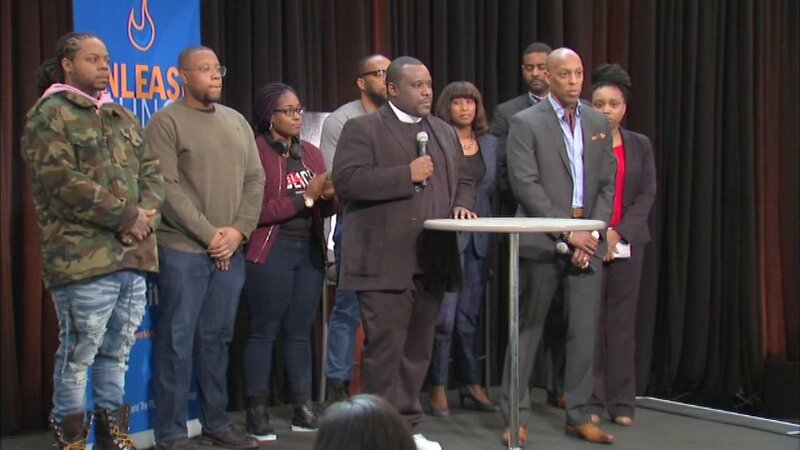 CHICAGO (WLS) -- Leaders of black churches, businesses and foundations launched Monday a new anti-violence movement in Chicago's South Loop. The philosophy of the new anti-violence partnership can be summed up like this: Nothing can stop a bullet like a job. At a Monday morning news conference, leaders of the movement talked about stopping violence in Chicago through creating jobs. The LIVE FREE campaign and the Solomon Group will kick off Monday a ten-city tour to help launch 1,000 black businesses that would generate an estimated $5 million in new revenue in cities across the country, including Chicago, Detroit, Cleveland and Memphis, Tenn.
"We're trying to foster entrepreneurship because there's a lot of creativity in our community. There's a lot of individuals with amazing ideas, amazing talents. But nobody is giving them the resources," said Robert Johnson, Solomon Group. "The number one factor of shifting violence is a job. The second factor is home ownership. The third factor is education," Rev. Otis Moss III, Trinity United Church of Christ. "If everybody brings some jobs and stuff for the younger youth and bring up the younger youth to generations like the future, everything will be good. Our future will be good, I believe," said King Louie, a Chicago rapper. Entrepreneurs hoping to start businesses will compete against each other Monday at 19 East in the South Loop, making pitches to win money to launch their companies. About $7,500 in seed capital will go to the winner. The theme of the businesses will promote social responsibility. The businesses will get support from experts. The new partnership hopes to do the same from city to city until they can launch 1,000 black businesses.